At the beginning of the last decade, the sport utility vehicle (SUV) was the bread and butter of the auto industry. Wanting load-hauling abilities without the gutless performance potential of the minivan, customer interest in SUVs or early crossover vehicles required every automaker to present one such vehicle into the marketplace. For summer of 2000, General Motors were encouraged to add a crossover vehicle their largely car-based Pontiac brand. 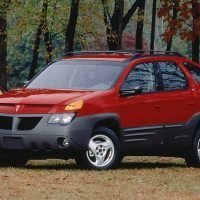 The Pontiac Aztek was introduced in the 2001 model year was a potential ace in the hole for capturing a slice of the emerging market. 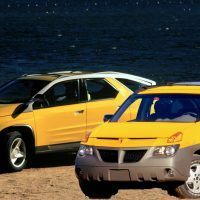 However, as we look at the auto brand in hindsight, some critics would even consider the Aztek as the harbinger for Pontiac’s recent demise. Tim Magazine even judged the Pontiac Aztek as ‘one of the most cars of all time’. 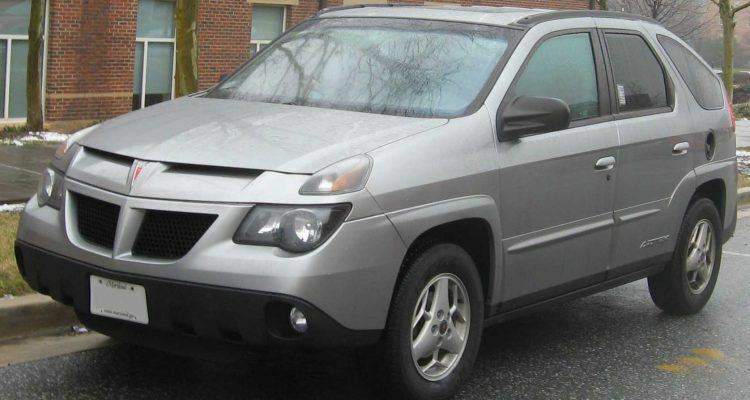 Could this really have been the case or is the Pontiac Aztek a misdirection of automotive hate. 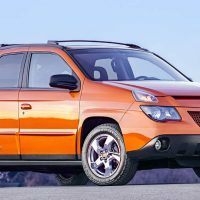 Flashing back 10 years, you probably remember the high-profile roll out of the 2001 Pontiac Aztek on the first season of the smash hit series Survivor. Sporting accessories such as all-wheel drive Versatrak system, a rubberized rear cargo floor and even a tent canopy the Aztek wanted to be unlike any other vehicle on the road. 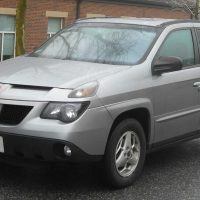 Providing some eye-catching utility attributes, the list price of the Pontiac Aztek was quality as attractive with a well-loaded model available for under $25,000. So where did the Aztek go wrong in appealing to the American driving public? The dominating source of criticism was always the exterior styling. 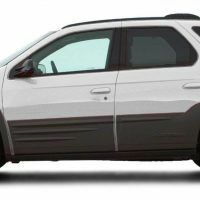 The production Pontiac Aztek was founded on the design inspiration of a concept vehicle which married car styling over a sport utility stature. A new concept with SUVs remaining truck-based behemoths, the crossover vehicle was still a product which has yet to determine the tasteful balance between both artistic qualities. Resulting in an appearance which has polarized the market, the Aztek would be faulted for using too much car inspiration in creating what appearance like a tall hatchback. Another design issue which injured the Aztek’s favour was a tired use of a gray body cladding. This styling cue worked on cars through the 1980s and maybe into the early 1990s but the presence on a 2001 model year crossover vehicle did not capture admiration. Replaced with colour-matching body mouldings from 2002 and on, the restyle after 1 year also sat poorly for Pontiac. 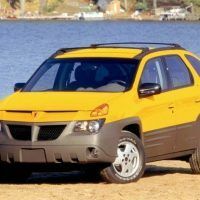 Personally, I was never a harsh critic on the Pontiac Aztek’s design preferring something bold to a rebadged Chevrolet (Much the result of the Pontiac Aztek’s successor, the Torrent). I even find it interesting looking at the all-new Acura ZDX almost being reminded of the Aztek. Hoping to new younger buyers, the Aztek’s customer’s demographic resulted in the vehicle transporting families in suburbia. Falling short of GM’s sales expectation, the Aztek did sell 108,449 units between the 2001-2005 model years. With Pontiac being a brand focused on providing a passionate on-road driving experience, the addition of the crossover could have immediately been viewed as a mismatch and a difficult sell. 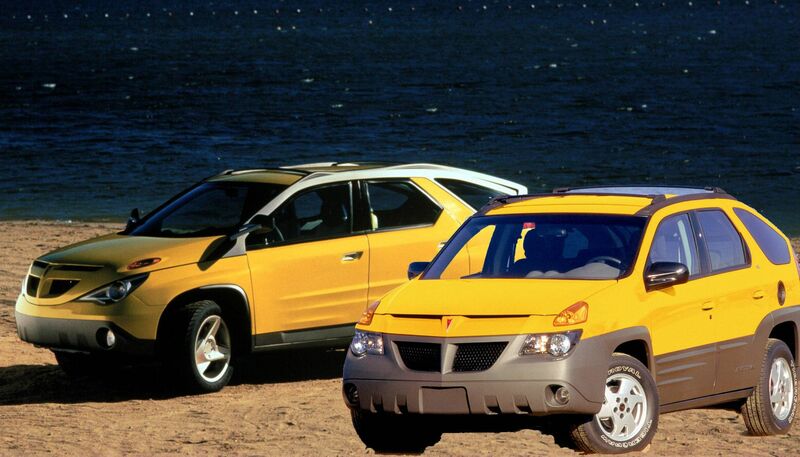 From 2001-2005, the Pontiac Aztek was the most ridiculed showroom car. 10 years after the crossover vehicle was listed for sale, was the criticism ever founded? Among all the Aztek critics, there are also admirers or perhaps Aztek warriors. 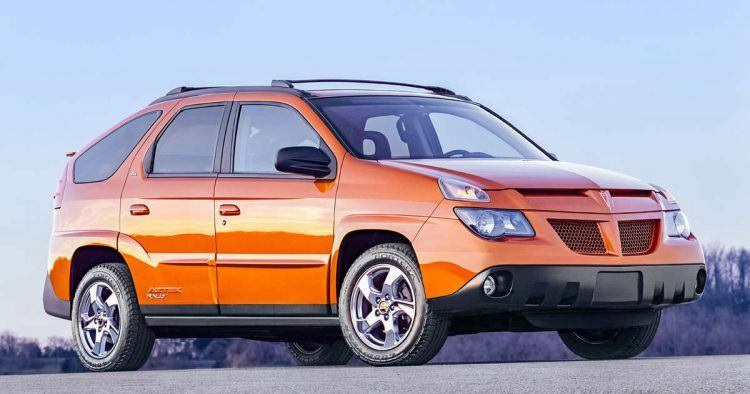 The Pontiac Aztek continue to enjoy the unconventional looks which reignites feelings of personal tastes. Over the decade, many Pontiac Azteks are still going strong with relatively few issues. In fact, the only recall needing to be served was on 2001 models for an air bag problem. Overall, these are not characteristics of the worst car of all-time. Perhaps the least loved car, fans of the Aztek is again proof of love being in the eyes of the beholder. 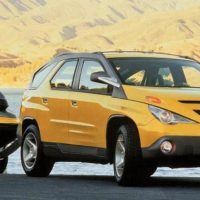 11 Comments on "Was the Pontiac Aztek So Bad? 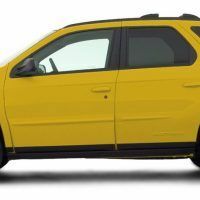 A Look Back at the Ugliest Car Ever Built"
Pontiac Aztec is nice car because of which many people are still admiring it. Ya there are concern about stlying abot hatchback and gray body cladding. Had the exterior styling of the production Aztek not deviated so much from the concept vehicle perhaps it would have been a better seller. It is ugly to some but the criticism was overdone. The upside for the not picky consumer was great deals in the 1-2 year old used market. I paid less than half the original sticker for a very low mileage one year old that now has 235,000+ miles. It hasn't been perfect but the only expensive repair was a leaky intake gasket and GM ate half the cost way after the car was out of warranty. My total repair expenses total maybe $600 for nine years of service. But just think, if they had made it like the concept (that is, much more attractive), it probably would not have been chosen as Walter White’s vehicle of choice on Breaking Bad. I have a aztek 2003 and runs good and personally makes the diference from the rest. I have the 2004 white and i like the look. it is different from the norm and thats what makes it unique. TimE Magazine. Time with an E .. and they called it one of the “most cars of all time?” Most what? yeah Ive noticed a couple of other spelling the name correctly, since the article didn’t. I have a 2004 with 185000 on odomoeter, only issue I had was the leaking gas cell which started AFTER the recall expired ( convenient, huh?). The Aztek are like some movies I’ve seen, if I listtened to the critics I never would have seen them. i have a 2003 Aztek. I love it . bought it in 2005 for 13,000. it now has 187,000 miles. It has had some small issues and the normal things that any car would need replaced eventually, but now i needs some gaskets replaced, its leaking oil, but heck its 14 years old now. I have an electrical short somewhere which has caused the light in the mileage window to go out and the light on the radio is out so you cant see the time or the channel on the radio. The short has now caused the blower for the heat and the air conditioning to go off and on, and lately its out more than its on. Also it seems like it has transmission issue but it been like that for years. i think it really has something to do with the short in the wiring that sometimes there is no problems at all and sometimes it acts up a little and sometimes a lot and then not at all again but really never gets and worse. it looks great and i like it so much i would rather fix it than get rid of it. over all its been a good car for a long time. i just hope i can get this short issue figured out. Just bought an 01. It’s been sitting for 3 years and still runs like a champ after knocking off the cobwebs. I frankly appreciated the back hatch design that blocked the glare (unintentionally) of headlights at night behind me. I could always still see enough of their lights, but not the obnoxious glare and I will miss that. Made a great small SUV for suburban driving and a few longer trips – and a perfect size vehicle for my wolfhounds! I will miss it.